Elite-Construction: - We are a small Building Company that has been established since 1974 and have a wealth of experience in the construction Industry. 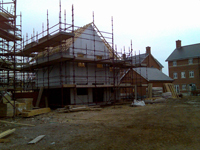 Elite-Construction employ our own friendly English work force and work to the highest standards. We pride ourselves on the quality of Service. All work will commence on the agreed date and we aim to keep disruption for your company or your family to a minimum. We at Elite-Construction always ensure that the project is left safe & tidy before leaving each day and we shall finish the project on time (weather permitted). We also have a wet blasting sister company that does exterior building refurbishments called Elite Eco Dustless Blasting we are an Eco friendly company offering a safe, non-toxic, non-pollutant dustless stripping, cleaning, removing service. Dustless blasting is the fastest, most cost effective surface preparation product there is. It can be used anywhere, virtually on any type of coating from any material can be removed very quickly without the mess. It is drastically quicker than the more traditional methods. We want our customers to be satisfied and so we strive to deliver the very best customer service from start to finish. Please contact a member of our team who will be happy to help with any questions you may have. Elite Eco Dustless blasting will remove the toughest coatings, yet can be adjusted to clean the most fragile surfaces from Concrete, metal, GPR, wood, soft metal, car body work, soft stone, cast iron, and the list goes on, without embedment or damage to the surface. Whether removing corrosion on a battleship or removing graffiti from sandstone, Elite Eco â€‹Dustless blasting cleaning is extremely versatile in a number of ways. Because cleaning speeds are so quick, and wet-abrasive consumption is minimal operating costs are typically a fraction of that of dry abrasive blasting. Little to no containment is required to protect adjacent buildings, equipment or the general public, saving considerable labor hours by minimising set-up and clean-up procedures.